Flue gas temperature is 800 ℃ and fuel cost is INR. 35.00/litre. The furnace is operated 24 hours/day, 300days/year and the fuel consumption is 1000 lit/hour. 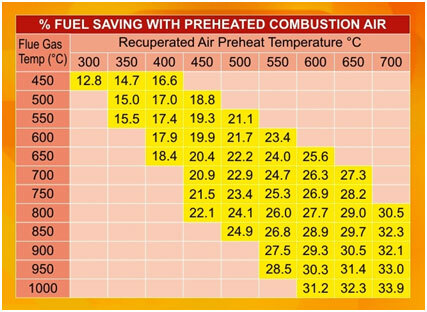 For comparison we initially preheat combustion air to 350 degrees Celsius and then increase it to 600 ℃.